Pioneers in the industry, we offer hearing aids from India. 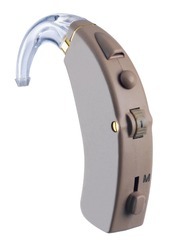 We are offering high-performance Clear Hearing Aids, which has state-of-the art technology. These provide the disabled with the ability to hear clear, detailed and natural sound also wireless accessories enhance the clarity of the sound. The hearing aids can be customized as per the requirements of the clients and are offered in various colors that match their skin tone.